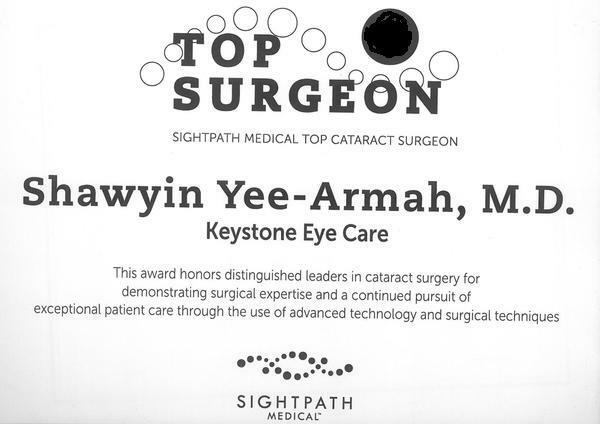 Shawyin Yee - Armah M.D. Shawyin Yee – Armah M.D. a.k.a. 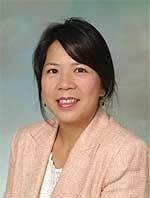 Dr. Yee to her patients and colleagues, received her doctorate from the New Jersey Medical School in 1993 and completed her Ophthalmology residency in 1997. She is Board Certified by the American Board of Ophthalmology. Dr. Yee has been practicing in Pennsylvania for the past ten years. She is a member of the PA Medical Society, York County Medical Society, as well as the AMA and the American Academy of Ophthalmology. She has published papers in the American Academy of Ophthalmology Journal. Her vast experience and sound knowledge in this field is frequently sought after by other ophthalmologists, optometrists, other medical specialists, and non-medical professionals. Dr. Yee has also been asked to provide expert witness testimony and consultations for legal cases. She is asked by medical device manufacturers and major pharmaceutical companies to conduct clinical trials on new medications and technologies. Few years ago she participated in the FDA clinical trial for a dosing aid used by glaucoma patients. Dr. Yee provides a full range of services from general eye care such as routine eye exams and contact lens exams to the latest and most advanced medical and surgical technology used in the care of cataracts, glaucoma and other eye diseases. One of the most recent advances in cataract surgery and lens implantation is the availability of an Accommodating Lens Implant for patients who don’t want to be dependent on their glasses. Eighty percent of patients using this lens technology can see at distance, intermediate and near without glasses. This particular technology is offered by Dr. Yee to qualified patients. She performs both medical and cosmetic related eyelid surgery. She has several years of experience in injecting Botox ® Cosmetic for youthful looking skin as well as for eyelid Blepharospasm. This is a condition where your eyelid twitches non stop for a few seconds to several minutes. This causes blurry or poor vision and difficulty focusing. Dr. Yee offers her patients an opportunity to ask questions and takes the time to explain all aspects of her patient’s diagnosis and treatment plan in straightforward, non-technical language. She keeps her patients informed about all the latest technology available.